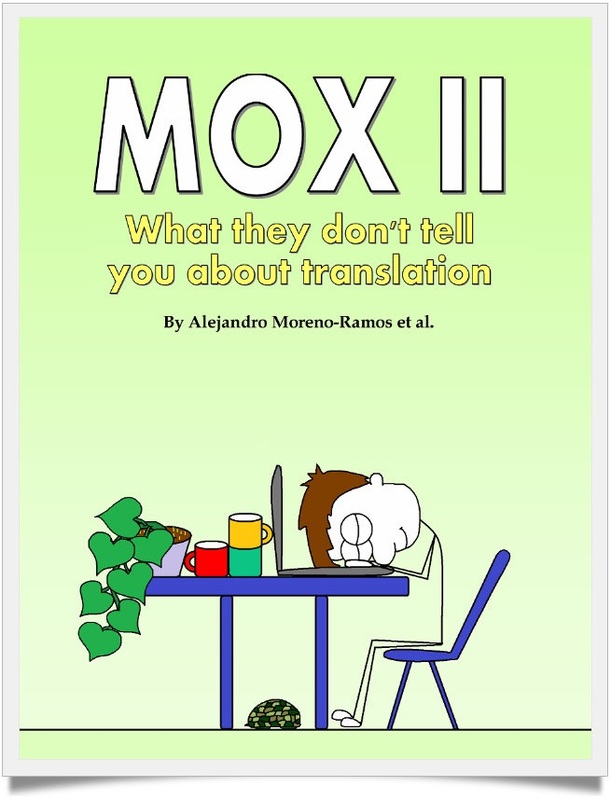 First, the big news: Alejandro Moreno-Ramos (aka Mox) has just published his second collection of cartoons for translators. Mox II: What they don’t tell you about translation has come out just in time for Christmas and is sure to make the perfect stocking stuffer for the freelance translator in your life. Now for my part in the story: I was invited by Alejandro to contribute to his new book. What follows is the Interpreter Diaries’ humble contribution to Mox’s mission of bringing a smile to the face of translators (and interpreters) everywhere. Enjoy! As a freelance conference interpreter with two small children, I spend a great deal of time thinking about how these two aspects of my life interact. I often worry about how having an interpreter for a mom might be detrimental to my kids’ development, and try to find ways to ensure that my hectic travel schedule, my schizophrenic way with languages and cultures, and my obsessive need to be informed about absolutely everything (to mention just a few of my better features!) have the least possible impact on my family. Today, I am going to give myself a break from all that brow-furrowing and instead take some time to think about why interpreters might actually make the very best parents of all. I’ll go through the various phases of childhood and demonstrate why the children of interpreters have got an edge over the rest. Maybe, by the end of this exercise, I’ll have managed to convince even myself! We will happily sing you various language versions of all the classic lullabies (did you know there are Dutch lyrics to “Frère Jacques”?). We will not feel compelled to bring in a nanny to teach you Chinese, Polish, or whatever language is currently in vogue at the nursery, since we reckon we can teach you everything you need to know about languages ourselves. We will have just as much fun as you do watching Dora the Explorer teach Spanish words to English kids (and English words to Spanish kids), although we may go a bit overboard when editorializing on the regional variations reflected in Backpack’s choice of terminology. We will ALWAYS have a pen and pad in our bag for you to doodle on when the wait gets too long at the restaurant. At show and tell, when you are asked to explain what your mommy or daddy does for a living, you will have plenty of answers to choose from (examples from real life: “My mommy sits in a glass box all day”, “My mommy gets paid to talk”, “My daddy packs suitcases for a living”). You will benefit from early exposure to trends in comparative literature (“You know, the Little Mermaid actually died at the end in the original Danish version”). We will teach you the correct pronunciation of foreign footballers’ names – a skill guaranteed to amaze your friends at recess. You will have the coolest collection of foreign coins and banknotes of all the kids in your class (until we requisition them for our next trip). If you are a very good boy all year, you may end up getting presents from Santa AND the Reyes AND Sinterklaas. We will fill your shelves with the original language versions of Tintin, Le Petit Prince, and other foreign kids’ classics – then happily sight translate them for you at bedtime. We will amaze you and your friends with our Trivial Pursuit skills (warning: the fact that your mom would appear to know everything, while seemingly cool now, will swiftly become a liability in the next developmental phase). Since we are used to commuting a thousand kilometers or more to work, we will never complain that Saturday’s swim meet in the next town is too much of a drive. Although we will insist that our iPhone is for replying to client emails and our iPad is for listening to Portuguese news podcasts, you will often be able to sneak in a game of Angry Birds when we’re not looking. We will teach you a few choice phrases to impress the cute new French girl in class with (although you may want to double-check the translations before you try them out on her). … we will not let you grow up to be interpreters. ← iPad: The Ideal Boothmate? Sight translate bedtime stories? Never thought of that, what a brilliant idea! However, I will be very happy if my future kids grow up to be interpreters. There’s no better profession in the whole wide world! You sure have convinced me! 🙂 I really should stop questioning it, too. I sight translate books to my kids too, for the same reason, Mommy speaks English and Daddy speaks Spanish. It’s great mind “pull-ups” for me and my kids are completely bilingual. I’d love to have them learn a third language, but the trouble is “time”. I can’t take them to the classes, BUMMER!!! But I would love for my kids to be interpreters….Don’t ask me why, maybe because I love it soooo much!!! It’s interesting to hear so many other parents sight translate for their kids, too! I have to say I draw the line at sight translating poetry. Or at least I tell the kids that it won’t sound as good as in the original because I can’t get the rhymes and cadence right. They don’t seem to mind. Also, in Spain, lots of parents want their children to grow up with English, so there are quite a few bilingual editions of kids’ classics and other books. We have a few of those, which come in handy at the end of a long working day! ¡Esta entrada me viene de maravilla ahora con la pequeña Gara en casa! Cuando le haya enseñado mejor inglés (está en una fase muy temprana) se lo volveré a leer para que se ría como una loca. Gara también tiene una situación bilingüe en casa, aunque no es la típica inglés-español o francés-español sino catalán-español. ¡Estos días la he tenido inmersa en un entorno catalán con la visita de sus abuelos maternos! Hi! I just love your blog and read it regularly! Not sure if this is the place or even if you’re the right person to ask but I’d like to apply to interpreting schools. The problem is, even when loonking on the AIIC website, there are so many of them in Europe. Which schools would you recommend apart from ETI in Geneva and ESIT in Paris? I was looking in the UK, Belgium or even Spain. Thanks! Thanks for your question, Agnes. I’m tempted to say you should come to La Laguna, where I teach, as it’s clearly the best school of all ;). A few things to keep in mind when choosing a school: first, make sure that they cater for your mother tongue. Not all schools train all booths. Also, if you have a language of lesser diffusion in your combination (such as certain Eastern European languages, Greek, Finnish, etc. ), you will want to ask if they offer training in that language. If you’re not sure, you can contact them and ask. Finally, it might be a good idea to train in a country where your mother tongue is spoken, as that will ensure you don’t struggle with interference from the immersion language. Of course, the fact that you’ve chosen a school doesn’t necessarily guarantee that they will choose you :). Many students apply to various schools in the hope that they will pass at least one of the aptitude tests, and then just end up going where they’re taken. Thanks for taking the time to get back to me! Unfortunately, la Laguna doesn’t catter for my language combination but University of Leeds and University of Mons in Belgium do. Have you heard of these schools? What are their reputations? Thanks again! I’ve heard of both schools and have met both trainers and graduates from both, but I really couldn’t tell you much more about them personally. If you are on Twitter and want to find out more about Leeds, why not ask @mayamakri and @mattperret, who have links with the training program there? I love it! I will share it with my two grown-up daughters, I’m sure they will love it too. Loved it! Already experiencing it with my 3-month-old baby. Thanks for your comments, Vanesa. I have a few colleagues who, like you, are “second generation” interpreters. I also know at least one person who is the daughter of an interpreter and very happy that she didn’t follow in her father’s footsteps. My kids will of course make up their own minds ;).